Easter holidays are always a busy time for families and here at the Museum it’s no different. Finding things to keep the whole family happy and entertained for a day out can be difficult to achieve. Many visitors to the Museum are surprised at the diverse things to do and they often comment that we are more than just an air museum. 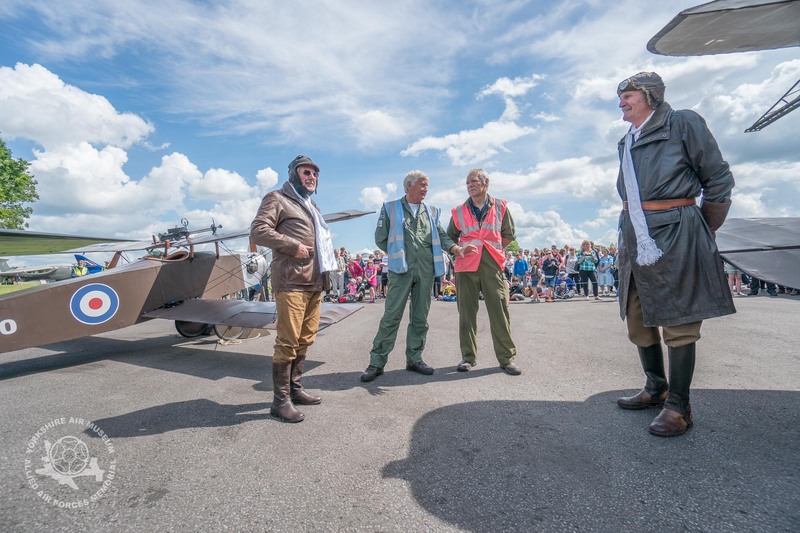 So here’s our guide for this summer that gives some great tips on getting the most from your visit to our parkland location, here at the former RAF Elvington WW2 airbase. Easter Sunday. Follow the White Rabbits Trail, learn more about the very important White Rabbit that flew with aircrews from here in World War Two and collect your own chocolate white rabbit. Climb aboard our C47 Dakota for our paratrooper experience, plus we will have four of the Museum’s amazing Fire engines on display: climb aboard with one of our Fire crew More details here. Park for Free. Unlike the City Centre of York, which can be difficult to access and often needs Park and Ride or car parking charges, here we have ample parking. And if you’ve brought a picnic or all of the other things that young children need to bring along on days out, then your car is only a short stroll away and easy to access throughout the day. Escape the congestion and enjoy a great alternative to a City centre. Pay once, return for free. Did you know that with our annual admission ticket, you can return to the Museum again throughout the summer for free? Pick up Your Museum Quiz Trail at the Entrance. Our 2018 Quiz trail is a great guide to the Museum and has a great trail and quiz with questions for all ages. Be sure to collect yours from our main entrance and get the maximum value from your visit. We’re Dog Friendly. For many dog owners, finding somewhere that you can bring along every member of the family, including the four legged one, is very difficult. Here at the Museum, we are dog friendly and welcome well behaved dogs. They are welcome everywhere except the NAAFI restaurant and the Museum shop. All we ask is that they’re under control and on a lead. We’re a dog friendly museum! Check to See What Our Guides are Talking About. Almost every day, our volunteer guides are presenting informal talks about interesting things here at the Museum. he talks range from an introductory chat about the Museum and the history of RAF Elvington to other subjects including our famous Halifax Friday the 13th WW2 bomber. Among some of the weirdest and amazing things kids love to see, there is the ‘ancestor’ of the mobile phone, an original wartime gas mask for children, pilots personal equipment and bullets of all sizes and shapes. Explore a Cockpit in the Air Power Zone, Daily, HP Hangar, Building 19. Our Canberra Bomber cockpit is exactly how the aircraft was configured in active service. Alongside the Canberra, we have a Jet Provost cockpit and a Handley Page Herald airliner, giving you a chance to experience the environment that trainee fighter pilots learned their trade in and view the flight deck of a vintage 1950’s airliner. Meet Our Mirage IV. Daily Inside the Main Hangar. Our Mirage IV nuclear jet arrived in March 2017 and has become a firm favourite with Museum visitors. The Mirage was a gift to the Museum from the French Air Force in recognition of the special relationship enjoyed by the people of the City of York and the French airmen who escaped from occupied France lived and served alongside the Royal Air Force in WW2. Visitors can walk beneath the nose of this amazingly beautiful Cold War Jet and compare her to Halifax Friday the 13th alongside. Read more about the Mirage IV project here. Explore the Aircraft Collection. Daily, around the Museum. With over 60 historic aircraft and vehicles, our collections span the entire history of flight from the early pioneers of aviation through both world wars and on through the Cold War era. Our collection of Cold War Jets is always very popular, while we have a very diverse range of World War Two aircraft too. Dakota Experience Daily, T2 Hangar or outside. Climb aboard our C47 Dakota, one of the world’s most famous military transport aircraft used by the Allies during WWII. Most days the big doors used for loading cargo or dispensing paratroopers are open for visitors to climb inside and experience that steeply inclined floor up to the old cockpit. Visit our Astra Cinema. The Museum’s own cinema shows a collection of period films and short documentaries that explain the sacrifices of the people that were based here at RAF Elvington in wartime, both No 77 RAF Squadron and the two French Squadrons that followed. A great location to rest your legs and learn a little more about this historic Yorkshire airbase. Food and snacks in our NAAFI Restaurant The Museum’s NAAFI style restaurant is the perfect location for a break and to enjoy some food. Choose from our range of full meals or enjoy a slice of huge cake and a coffee.